With Winter comes the chance to put the flood of detecting finds made through late summer and autumn into order and evaluate their meaning. The finds from the Bronze Age 'factory' site (read here) were certainly the remains of something meaningful, but without excavation to evaluate their underlying context I thought nothing could be ventured other than they were the evidence of some kind of settlement. Which clearly they were. 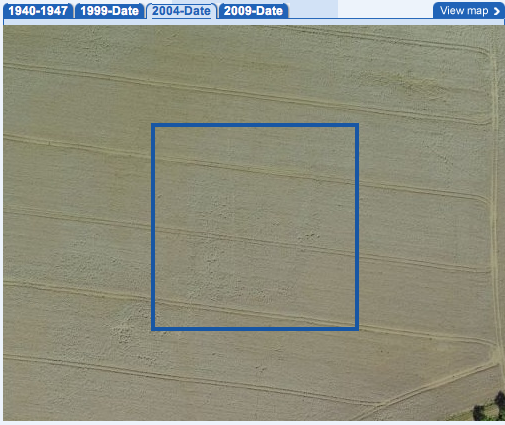 About that time in the mid-2000's, aerial mapping had become available on the Internet. It wasn't easy to navigate on a dial-up modem and reloading frames to move just a few hundred of yards would take ages. Nevertheless, it was fascinating stuff and promised to unlock plenty of secrets if only the pictures were of fields in perfect condition to reveal them. Unfortunately, the majority were far from ideal. Undaunted, I scanned across my entire operating area of three parishes and downloaded every frame to make a composite map from. I did discover things I didn't know about before, but to be frank, it was as confusing as it was enlightening with all kinds of features 'made' into what they were not, and details that later proved to be direct evidence of things, completely missed or ignored. I no longer have those original images (luckily I've rediscovered them on the Internet since!) but remember clearly the sequence of events concerning the Bronze Age site. 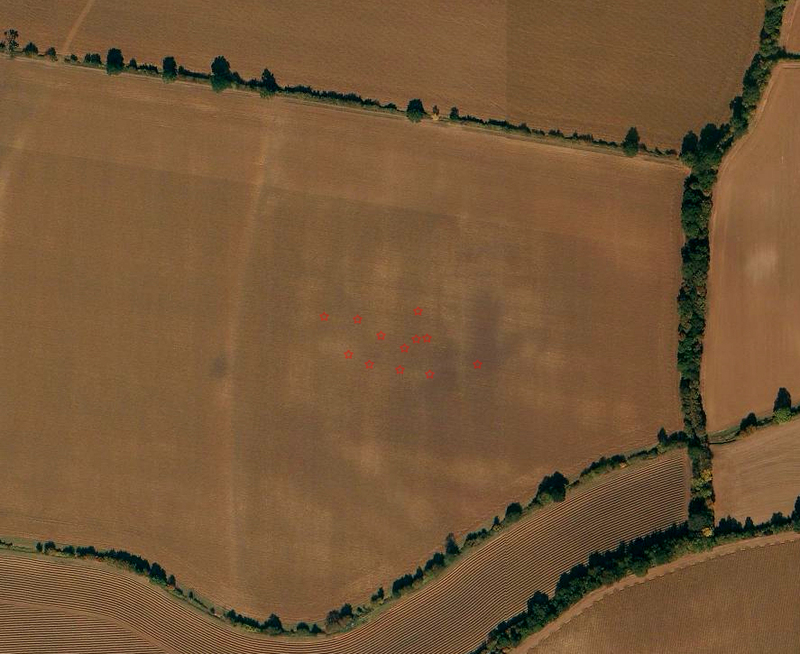 Firstly, there was an aerial shot of the field in crop taken in 2004. 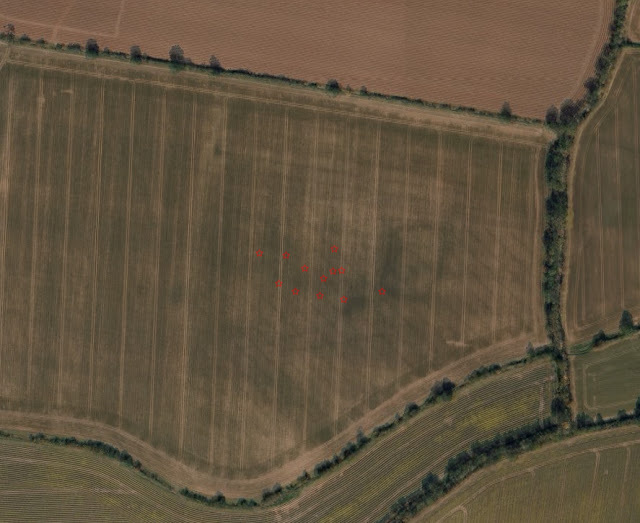 This was the same year I discovered the site but the shot was of a field of ripening wheat taken in late-summer, not when ploughed and harrowed in autumn when it might have revealed more than it did. There was hardly anything to see but a slight mark where there's a shallow depression in the field that I already knew about. I found nothing there of Bronze Age date but did make a few Roman period finds of a Colchester brooch, a small bronze mount, and two coins, one of which was a third century issue in very poor condition and the other a far more interesting 1st Century bronze issue of probably Vespasian, with a legionary eagle on the reverse. 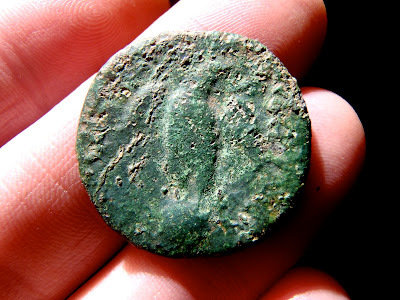 These Roman finds were nothing that couldn't be found in a day anywhere else in the locality in fact such a number of finds would seem a poor haul in places. I thought it odd, though, that this field had never given up a single Roman find before — also that a Flavian copper dating to the 1st century was the earliest Roman coin I'd ever found in the local area. Unfortunately, by the time I returned the field had been quickly turned around and was drilled, so I'd missed my opportunity to extend my knowledge of the field's Bronze Age past for another year. Tragically, unforeseen domestic circumstances that winter forced a relocation the Midlands where I was then too far distant from Essex for any chance of a return, so it was also my last. 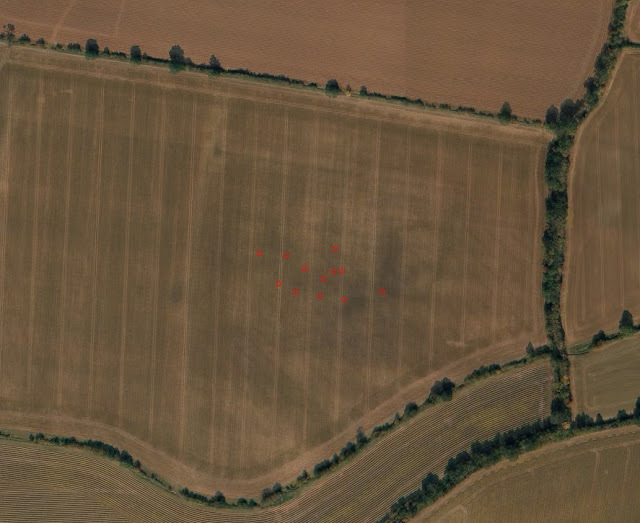 I took a closer look and saw a faint dark line around the large dark mark that looked like half of a square enclosure. Oddly, this 'square' seemed larger than the original sub-circular enclosure I'd hoped to see, but of which there was no visible trace. The individual findspots of the scattered fragments of pottery that I'd noted in the field in a log, were plotted on to the aerial shot in hope of them revealing something. They failed to. 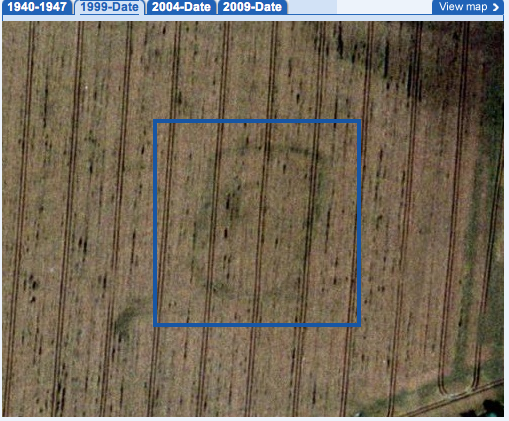 I couldn't see anything I didn't already know of and had no way of going back on site to examine those light soil marks to see what they were all about or to see if that fine dark mark in the shape of a square was real or just an illusion. I was dumbstruck when I first discovered these new pictures because they proved that the marks that I once thought might be an enclosure really were after all. They also revealed much greater detail than any previous picture had so it's possible to see that there's probably a second smaller enclosure inside. The best thing is though, they've proven beyond reasonable doubt that those pottery and metal finds really are not the traces of a long-vanished 'itinerant' bronze-smith's encampment, but really do belong to something important, substantial and long-lasting in the Bronze Age landscape of Essex. All finds and site Epping Forest District, Essex. The Lexden Boar — Victim of Acid Attack? Knights of The Holy Sepulchre — My Arse!